Any UI designer deals with form controls quite a bit. Often the checkboxes, selects, and radio buttons do not look consistent in all the browsers. Uniform, a plugin for jQuery lets you style select, radio, and checkboxes however you desire. 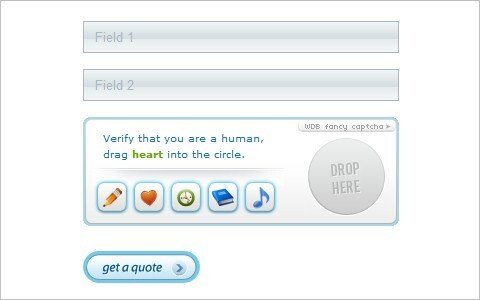 This robust, flexible jQuery plugin can validate a form like you’ve never been validating before. It is designed for an unobtrusive user experience, annoying the user as little as possible with unnecessary error messages. It helps a site react to more then just a submit event, like keyup and blur, without complex setup. jQuery Nice allows you to create custom looking form elements, that function like normal form elements. It is a simple form, but you can make it appear as complex or customized as you need. Are you tired with your old fashion dropdown? Try this new one, an image combo box. You can add an icon with each option. It works with your existing “select” element. This plugin is a jQuery styling plugin which allows you to skin form elements with your own options for whatever browser you use. Password Strength Meter is a jQuery plug-in to provide you a smart algorithm that can detect the strength of a password. This jQuery mask form input plugin has many new features, compatibility, usage, options, fixed characters, and rules. Masks can be setup and tweaked to fit your needs, such as fixed or reversed mask types, has function to mask strings, while still allowing hotkey usage. It works with the iPhone, supports metadata plugin, and much more. Metadata will always overwrite the ‘attr’ value. An update for the jQuery validation plugin is available. There is a small code fix, a new supported locale (slovak) and most notably, a new demo featuring integration with jQuery UI tabs and grouping selects. Support is available via jQuery discussion list and bug tracker. This plugin filters keyboard input by specified regular expression. The source code inspired by Ext.JS, but was modified to provide more accurate logic. Boxy is a flexible, Facebook-style dialog box for jQuery with support for dragging and size tweening. It differs from other overlays by providing an object interface to control dialogs after they’ve been created. It is simple to use and provides a jQuery plugin for automatically hooking up links and forms, as well as an ask() helper for presenting multiple choices to the user.